The original settlement of Kendal was founded in 1812 by Thomas Rotch, a Quaker originally of New Bedford, Massachusetts, and Hartford, Connecticut. James Duncan of New Hampshire first settled in Kendal before recording the plot for Massillon in December 6, 1826. Duncan, known as the city's founder, named the town after Jean Baptiste Massillon, a French Catholic bishop, at the request of his wife. The town plat was established along the east bank of the Tuscarawas River, which was the surveyed route for the Ohio and Erie Canal being constructed to connect Lake Erie with the Ohio River. The canal section spanning from Cleveland to Massillon was completed in 1828. 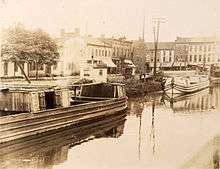 Massillon quickly became a major port town along the canal route, known as the Port of Massillon, following the canal's completion in the 1832. The first telegraph lines would reach Massillon in 1847, and the Ohio & Pennsylvania Railroad would extend its rails to Massillon in 1852. 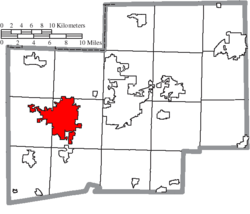 Massillon incorporated as a village in 1853. In 1868, Massillon incorporated as a city when the populated reached 5,000. The C. M. Russell & Company, formed in 1842 by Charles. M. Russell and his brothers, Nahum Russell and Clement Russell, manufactured threshing machines and other agricultural implements in Massillon. The company began producing train cars in 1852 and incorporated in 1864 as Russell & Company Inc. In 1884, Russell & Company begain producing its famed steam traction engines and quickly became one of the largest producers of industrial and agricultural equipment. A merger with the Griscom-Spencer company in 1912 created the Griscom-Russell Company. Griscom-Russell produced heat exchangers for the United States Navy during World War II. The company closed in 1962. The Massillon Iron Bridge Company was founded by Joseph Davenport in 1869  after moving to Massillon from Boston to work at the C. M. Russell & Company. Davenport also invented and built the first locomotive "cowcatcher" and cab in Massillon. The company incorporated in 1887 as The Massillon Bridge Company. The Massillon Bridge Company designed and built steel truss bridges up through the mid-1900s, many of which stand today. 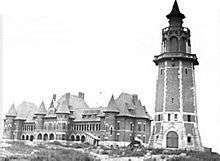 The Massillon State Hospital for the Insane opened in 1898 on 240 acres of land given to the state of Ohio for the purpose of constructing the hospital. The hospital was established by Ohio governor William McKinley. By 1950 there were 3,100 patients in the hospital. Today it is known as Heartland Behavioral Healthcare. The Forest City Motor Company was founded in Cleveland in 1906 but relocated to Massillon that same year. Forest City produced approximately 1,000 of their Jewel automobiles in Massillon between 1906 and 1909. The name of the company was changed to the Jewel Motor Car Company but the company eventually ceased production in 1909. Although steelmaking and fabrication is found throughout its history, some say Massillon's steel age didn't start until 1909, when the first sheet of steel was rolled at the Massillon Rolling Mill Company. Massillon Rolling merged into the Central Steel Company in 1914, and lit its first open hearth furnace in 1915. Central Steel eventually became known as the Central Alloy Steel Company. In April 1930, Central Alloy merged with Republic Steel, becoming the third largest steel company in the world, with its Massillon operations employing nearly one-half of the city's workforce by 1959. This included other Massillon divisions like Massillon Union Drawn Steel and its stainless steel division Enduro Stainless. In 1984 Republic Steel was purchased by LTV Steel. Enduro closed in 1985, and it and other stainless plants went through several ownership changes over the following 15 years. The main Republic facilities on the southwest side of Massillon closed by 2002. Stanley Macomber designed the open-web steel joist in 1921 while working for Massillon's Central Steel Company. Macomber left Central Steel and founded the Massillon Steel Joist Co. in 1923. His open-web steel joist, patented in 1924, was known as the Massillon Steel Joist. Macomber's invention was a revolutionary assembly of steel joists with a top slab used to support of floors, ceilings and roofs. The basis of Macomber's steel joist design is still used today. Stanley Macomber was inducted into the Inventors Hall of Fame in 2011. Lincoln Highway, the first U.S. highway to run from coast to coast, was envisioned in 1913 and followed Main Street through the center of Massillon. Main Street was eventually renamed Lincoln Way in recognition of the new highway. In 1928, the federal government renamed Lincoln Highway to U.S. 30. A controlled access freeway was constructed in 1971, bypassing U.S. 30 around to the city's most southern part. The old Lincoln Highway that runs through Massillon and Canton was reassigned as State Route 172. Massillon was a site where one of the most tragic instances of anti-union violence in the history of the United States occurred. The Steel Workers Organizing Committee began an attempt to organize workers at Republic Steel in the spring of 1937, following the unionizing of workers at the country's two largest steel companies US Steel and Jones & Laughlin Steel. In retaliation, Republic Steel expelled over 1000 union supporters at plants in Canton and Massillon. On May 26, the union eventually called for all workers at Republic Steel, Youngstown Sheet and Tube, and Inland Steel (together known as Little Steel) to strike in response to the treatment of workers in Massillon and Canton. On the night of July 11, 1937, a car failed to dim its headlights as it approached a police barracade near a picket line at one of the Massillon plants. City police assumed the worst and without warning opened fire with rifles and shotguns. Police then used this infraction to raid a peaceful crowd that was gathered in front of the union headquarters. Police pumped tear gas canisters and opened fire into the fleeing crowd. Joined by National Guardsmen, the police destroyed the union hall and arrested every suspected unionist they could find. Three men were killed and hundreds were injured during this incident. Ohio Historical Marker #18-76 was erected in 2004 in front of the Massillon City Hall in memory of the Little Steel Strike of 1937. Jacob S. Coxey, Sr., sometimes known as General Coxey of Massillon, was an American politician who ran for elective office several times in Ohio. He twice led Coxey's Army, in 1894 and 1914, consisting of a group of unemployed men that he led on marches from Massillon to Washington, D.C., to present a "Petition in Boots" demanding that the Congress allocate funds to create jobs for the unemployed. Although his march failed, Coxey's Army was an early attempt to arouse political interest in an issue that grew in importance until the Social Security Act of 1935 encouraged the establishment of state unemployment insurance programs. Jacob Coxey was elected mayor of Massillon in 1931 and served one year. 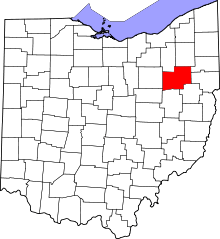 Massillon is at 40°47′48″N 81°31′17″W﻿ / ﻿40.79667°N 81.52139°W﻿ / 40.79667; -81.52139 (40.7967, 81.5214), along the Tuscarawas River. According to the United States Census Bureau, the city has a total area of 18.76 square miles (48.59 km2), of which 18.58 square miles (48.12 km2) is land and 0.18 square miles (0.47 km2) is water. As of the census of 2000, there were 31,325 people, 12,677 households, and 8,328 families residing in the city. The population density was 1,870.3 people per square mile (722.1/km²). There were 13,567 housing units at an average density of 810.0/sq mi (312.7/km²). The racial makeup of the city was 88.18% White, 9.39% African American, 0.23% Native American, 0.25% Asian, 0.34% from other races, and 1.60% from two or more races. Hispanic or Latino of any race were 0.96% of the population. There were 12,677 households out of which 29.8% had children under the age of 18 living with them, 47.8% were married couples living together, 13.8% had a female householder with no husband present, and 34.3% were non-families. 29.6% of all households were made up of individuals and 13.6% had someone living alone who was 65 years of age or older. The average household size was 2.40 and the average family size was 2.96. In the city the population was spread out with 25.3% under the age of 18, 7.9% from 18 to 24, 28.1% from 25 to 44, 22.5% from 45 to 64, and 16.1% who were 65 years of age or older. The median age was 38 years. For every 100 females there were 92.6 males. For every 100 females age 18 and over, there were 85.5 males. The median income for a household in the city was $32,734, and the median income for a family was $41,058. Males had a median income of $32,021 versus $22,327 for females. The per capita income for the city was $17,633. About 8.3% of families and 10.7% of the population were below the poverty line, including 15.5% of those under age 18 and 7.4% of those age 65 or over. As of the census of 2010, there were 32,149 people, 13,140 households, and 8,268 families residing in the city. The population density was 1,730.3 inhabitants per square mile (668.1/km2). There were 14,497 housing units at an average density of 780.2 per square mile (301.2/km2). The racial makeup of the city was 87.4% White, 8.8% African American, 0.3% Native American, 0.4% Asian, 0.5% from other races, and 2.6% from two or more races. Hispanic or Latino of any race were 2.0% of the population. There were 13,140 households, of which 29.6% had children under the age of 18 living with them, 42.9% were married couples living together, 14.9% had a female householder with no husband present, 5.1% had a male householder with no wife present, and 37.1% were non-families. 31.1% of all households were made up of individuals and 13% had someone living alone who was 65 years of age or older. The average household size was 2.37 and the average family size was 2.95. The median age in the city was 40.1 years. 22.9% of residents were under the age of 18; 8.2% were between the ages of 18 and 24; 24.9% were from 25 to 44; 27.1% were from 45 to 64; and 16.7% were 65 years of age or older. The gender makeup of the city was 48.5% male and 51.5% female. 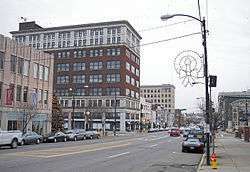 Massillon has a central business district along Lincoln Way stretching from approximately State Route 21 to Wales Road. There are a few shopping areas, notably Towne Plaza, Amherst Shopping Center, Mayflower Shopping Center, Massillon Marketplace and Meadows Plaza. The city is governed by an elected mayor and city council. There are six council positions representing the city's six wards and three at-large council positions. The Massillon municipal court system serves all residents in western Stark county located in the cities of Massillon, Canal Fulton and Bethlehem Twp, Jackson Twp., Lawrence Twp., Perry Twp., Sugar Creek Twp., Tuscarawas Twp., Villages of Beach City, Brewster, Hills and Dales, Navarre and Wilmot. Additionally, the R.G. Drage Career Technical Center of the Stark County Area Vocational School District is located within city limits. Private schools serving the Massillon area include Massillon Christian School, St. Barbara's Elementary, St. Mary's Elementary, and Central Catholic High School. Ashland University, based in Ashland, Ohio, has a satellite campus in Massillon that offers graduate degrees in business and education, as well as professional development and licensure courses. The Massillon Museum was established in 1933 in order to preserve the city's rich history. The museum was accredited in 1972 by the American Alliance of Museums and is currently located downtown in the historic Gensemer Brothers Dry Goods building. The museum's collection encompasses approximately 100,000 objects in 94 categories, 60,000 photographs, and 18,000 archival and reference documents. The Immel Circus is one of the museum's most interesting collections. The 100-square foot miniature circus contains 2,620 pieces: thirty-six elephants, 186 horses, 102 assorted animals, ninety-one wagons, seven tents, and 2,207 people. Most of the pieces were hand-carved by Dr. Robert Immel of Massillon using tools from his dental practice. The 1915 landmark movie theatre, designed by Guy Tilden, was saved from demolition by the local Lions International club in 1982. The theatre is thought to be one of the oldest purpose-built movie houses in the country still in operation. One of the theatre's two arc-lamp 35mm projectors was replaced by a digital projector in 2013. Today the theatre hosts community events, and screens classic and second-run movies on weekends. The stage also hosts live theatre. In 1989, the play Dear Mother and All, a World War I play based on letters of Massillon native Charles Vernon Brown and his friends and family, debuted at the theatre. The Ohio Military Museum is operated by the Ohio Society Of Military History and is home to thousands of artifacts and tributes to the men and women of Ohio who served in the armed forces. The museum is moving to the Maps Museum very soon. The City of Massillon Parks & Recreation Department operates a recreation center, senior center, and 35 parks and open spaces. Massillon's municipal golf course, The Legends of Massillon, opened in 1995. The City maintains the Stark County section of the Sippo Valley Bike & Hike Trail, leading trail users to Dalton in Wayne County. The Ohio and Erie Canal Towpath Trail also passes through the city. Football has long been one of the most prominent contributions to the culture of Massillon. While the first players known to be paid to play football are believed to have played for club teams in the Pittsburgh, Pennsylvania area, perhaps the first great professional football rivalry was between the Massillon Tigers and Canton Bulldogs from 1903 to 1906 and 1915 to 1919. This rivalry predates both the NFL and the aforementioned rivalry between the Massillon and Canton high schools which continue to use the nicknames of these early professional teams. The Professional Football Researchers Association (PFRA) web site includes articles about the early years of this rivalry, as well as articles about the history of football through the 1970s. The name Massillon is most notably associated with the Massillon Washington High School football team, the Tigers. Distinguished Massillon alumni include former Ohio State University, Cleveland Browns, and Cincinnati Bengals coach Paul Brown, and former Ohio State University player and former NFL All-Pro linebacker Chris Spielman. The Tigers are historically one of the winningest high school football teams in the United States, second only to Valdosta High School in Valdosta, Georgia. Along with the Canton McKinley High School Bulldogs, the Tigers represent one half of what many consider to be the greatest high school football rivalry in the nation. Both Massillon and their fierce rivalry with Canton are subjects of the 2001 documentary film Go Tigers!. Massillon's Paul L. David Athletic Training Center was built in 2008 by local philanthropist Jeff David in honor of his late father. The 3 million dollar, 80,000 square foot building is the largest indoor football practice facility in the state of Ohio, 20,000-square-feet larger than the facility used by the NFL's Cleveland Browns. The Massillon Tigers have accumulated 22 state AP championships and 9 national AP championships during the school's history. As of 2012, the Tigers have accumulated an overall record of 837-249-35, a record not approached by any other Ohio high school football team. In the years since the Ohio high school playoff system was instituted in 1972, the Tigers have accumulated a current record of 316-117-4. The Tigers have made the playoffs 19 times, the final four six times, and the final championship game three times. There have been 23 professional players, 3 NFL coaches, and 14 collegiate all-Americans that have graduated from Massillon Washington High School. The Massillon Tiger Swing Band was created by George "Red" Bird in 1938 during the Paul Brown era of Massillon football. The band became known as "The Greatest Show in High School Football" and is still a very important part of the Massillon football tradition. The band's swing style includes moving formations and musicians marching with a swing step. Bird invented the 6 to 5 step. The Tiger Swing band begins every home football game with the traditional hometown songs of Massillon Will Shine, Stand Up and Cheer (to acknowledge the other team), the National Anthem, Eye of the Tiger and the WHS Alma Mater. At the beginning of each half time show, they perform what is known as "Opening Routine." This is a tradition that goes back for decades and consists of the band's entrance ("Turn Arounds") followed by Fanfare, Tiger Rag and Carry On. This entire routine is marched at 180 beats per minute and is practiced through the entire season from the beginning of the rehearsals in the summer time. In July 2008 Massillon was nominated as one of only twenty cities nationwide as a finalist in ESPN's "Titletown U.S.A" contest. On July 21, a rally was held at Paul Brown Tiger Stadium while ESPN filmed a segment that was aired on SportsCenter. Massillon finished fourth in the voting behind Valdosta, Georgia; Parkersburg, West Virginia; and Green Bay, Wisconsin. Massillon is served by the following state and federal highways: US Route 30, US Route 62, Ohio State Route 21, Ohio State Route 172, Ohio State Route 241, Ohio State Route 236, and Ohio State Route 93. Interstate 77 bypasses the city to the east and is accessible via interchanges on US-30, SR-21, SR-241, and SR-172. Stark Area Regional Transit Authority (SARTA) has a transit center downtown and provides public transit bus service within the city, including service to Canton, the Akron-Canton Regional Airport, and the Amtrak station located in Alliance. Fidelity US Coach Tours provides charter bus service from the city. Akron-Canton Regional Airport is 10 miles north of the city and provides daily commercial passenger and air freight service. Amtrak offers daily service to Chicago and Washington, D.C. from a regional passenger station in Alliance, Ohio. Passenger rail service within the city was ended in 1971. Norfolk Southern, Wheeling-Lake Erie, and the R. J. Corman railroads provide freight service in Massillon. Massillon is part of the greater Cleveland and Akron markets. The Independent is the local newspaper serving the city of Massillon and western Stark County. WTIG AM 990 is located in Massillon and serves the local Massillon/Western Stark County area. Massillon Cable TV provides local access television for Massillon as well as portions of Bethlehem, Jackson, Perry, and Tuscarawas townships. John Blackburn, wrote the lyrics of "Moonlight in Vermont"
Robert R. Scott, Machinist's Mate First Class aboard the USS California (BB-44) posthumously awarded the Medal of Honor for heroism during the Japanese attack on Pearl Harbor. Devin Smith, wide receiver for the New York Jets of the National Football League and Ohio State University. 1 2 "US Board on Geographic Names". United States Geological Survey. 2007-10-25. Retrieved 2008-01-31. ↑ "Population Estimates". United States Census Bureau. Retrieved 2013-06-17. ↑ ZipCodes.com. "MASSILLON, OH - ZIP Code Database, ZIP Code Maps". Retrieved 2012-11-30. ↑ Stark County Recorder's Office, Plats, Book 5. p. 17. ↑ "Captain Pearl R. Nye: Life on the Ohio and Erie Canal - Timeline 1803 -1950". U.S. Library of Congress. Retrieved 2012-11-30. 1 2 3 4 5 6 7 8 9 10 11 "Massillon Museum | Research". Massillon Museum. Retrieved 2012-11-30. ↑ "The C.M. Russell Mansion...will be razed". The [Massillon] Evening Independant. CII (297): 3. June 22, 1965. ↑ "The Early History of The Russell & Company". Retrieved 2012-11-30. 1 2 Vogt, Margy (2009). Massillon: Reflections of a Community. Margy Vogt. 1 2 "WEP: Historic Topics: Greatest Generation". Massillon Museum. Retrieved 2012-11-30. ↑ Sues, Hannah. "Massillon History: Massillon State Hospital". Retrieved 2012-11-30. ↑ "Heartland Behavioral Healthcare". Ohio Department of Mental Health. Retrieved 2012-11-30. ↑ Clymer, Floyd (1950). Treasury of Early American Automobiles, 1877-1925. New York: Bonanza Books. ↑ Sues, Hannah. "Industry in Massillon". Massillon Museum. Retrieved 2012-11-30. ↑ "Republic Steel Corp.". Chicago Historical Society. Retrieved 2012-11-30. ↑ Associated Press (2000-02-03). "Ohio Steel Plant to Reopen". Pittsburgh Post-Gazette. Retrieved 2012-11-30. ↑ Rink, Matthew (2012-10-09). "Permit issued to demolish former Republic Steel HQ". Massillon Independent. Retrieved 2012-11-30. ↑ Huba, Stephen (2008-04-11). "He revolutionized an industry". Massillon Independent. Retrieved 2012-11-30. ↑ "Stanley Macomber". National Inventors' Hall of Fame. Retrieved 2012-11-30. ↑ Weingroff, Richard F. "The Lincoln Highway". USDOT FHWA. Retrieved 2012-11-30. ↑ Eggleston, Kelly. "America's Main Street: The Lincoln Highway". Massillon Museum. Retrieved 2012-11-30. ↑ Ziegler, Robert H. (1995). The CIO, 1935-1955. Chapel Hill, NC: University of North Carolina Press. pp. 62–63. ISBN 0-8078-2182-9. ↑ "Remarkable Ohio". Retrieved 2012-11-30. ↑ "USGS GeoNames". USGS. Retrieved 2012-11-30. ↑ "Massillon, OH Neighborhood Map". City-Data.com. Retrieved 2012-11-30. ↑ "History of Affinity Medical Center". Retrieved 2012-11-30. ↑ "Massillon - 17th Street". Ameri Cold. Retrieved 2012-11-30. ↑ "Aqua Ohio Home". Aqua Ohio. Retrieved 2012-11-30. 1 2 3 4 5 6 7 Rink, Matthew (2010-05-01). "Manufacturing far from dead in the city of Massillon". Massillon Independent. Retrieved 2012-11-30. 1 2 "Massillon Area Chamber of Commerce". Massillon Area Chamber of Commerce. ↑ "About Our Company". The Health Plan. Retrieved 2012-11-30. ↑ "Cable Academy 2010". Retrieved 2012-11-30. ↑ "Midwestern Industries". Retrieved 2012-11-30. ↑ "People Services - Locations - Massillon Ohio". Retrieved 2012-12-01. ↑ "Strategically Placed Special Bar Quality Locations Better Serve our Customers". Republic Steel. Retrieved 2012-11-30. ↑ Rink, Matthew (2012-08-31). "Shearer's expected to remain committed to Massillon". Massillon Independent. Retrieved 2012-11-30. ↑ "Tower Industries : About". Retrieved 2012-11-30. ↑ "City of Massillon - Massillon Municipal Court". Retrieved 2012-11-30. ↑ "Stark County School Districts". Public Utilities Commission of Ohio. Retrieved 2012-11-30. ↑ Rink, Matthew (June 2, 2010). 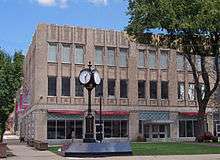 "Commissioners approve Massillon's annexation of R.G. Drage property". Massillon Independent. ↑ "Massillon/Stark Center". Ashland University. Retrieved May 4, 2016. ↑ "History of the Museum". Massillon Museum. Retrieved 2012-11-30. ↑ "About the Library & Archives". Massillon Museum. Retrieved 2012-11-30. ↑ Pond, Mandy Altimus. "Immel Circus". Massillon Museum. Retrieved 2012-11-30. ↑ "Lions Lincoln Theatre :: History". Retrieved 2012-11-30. ↑ Downing, Bob (1989). "Doughboy's story is window on past". Akron Beacon Journal. ↑ "about us". City of Massillon. Retrieved 2012-12-06. ↑ Brown, Gary (2012-09-11). "Postcard from ... Tuscarawas Township: Sippo Valley Bike and Hike trail passes beside a little-known nature preserve". The Canton Repository. Retrieved 2012-12-06. ↑ "Ohio & Erie Canal Towpath Trail". OhioBikeways.net. Retrieved 2012-12-06. ↑ Braunwart, Bob; Carroll, Bob (1981). "The Ohio League" (PDF). The Coffin Corner. Professional Football Researchers Association. Retrieved 2008-06-11. 1 2 "Paul E. Brown Chronology". Paul Brown Museum. Retrieved 2012-11-30. 1 2 Gordon, Roger. "Chris Spielman" (PDF). Retrieved 2012-11-30. ↑ Malone, Christian (2006-07-28). "Valdosta vs. Massillon a possibility". Valdosta Daily Times. Retrieved 2012-11-30. ↑ Pesca, Mike (2009-11-20). "In Massillon, High School Football is "Who We Are"". All Things Considered. Retrieved 2012-11-30. ↑ "Go Tigers! (2001) - IMDb". IMDB. ↑ "Massillon Paul Brown Tiger Stadium" (PDF). MassillonTigers.com. Retrieved 2012-11-30. ↑ "OHSAA Football Information". Ohio High School Athletic Association. Retrieved 2012-11-30. ↑ "Drum Corps International Competition". Pro Football Hall of Fame Festival. Retrieved 2012-11-20. ↑ Schumacher Construction. "Schumacher Construction". Retrieved 2012-11-30. ↑ Warsinskey, Tim (2008-10-14). "Tim's Take: Team practice - Massillon's got it covered". Blog.Cleveland.Com (The Plain Dealer). Retrieved 2012-11-30. ↑ Arnold, Wilbur. "History of the Massillon Tigers". MassillonTigers.com. Retrieved 2012-11-30. ↑ "Tiger Swing Band - History of the Massillon Tiger Swing Band". Tiger Swing Band. Retrieved 2012-11-30. ↑ "Massillon caps ESPN TitleTown segments". The Independent. 2008-07-23. Retrieved 2008-07-23. ↑ "No TitleTown for TigerTown". The Independent. 2008-07-28. Retrieved 2008-07-29. ↑ "Massillon, Ohio - Google Maps". Google. Retrieved 2012-12-01. ↑ "SARTA Fixed Route System Map". Stark Area Regional Transity Authority. Retrieved 2012-12-01. ↑ "Fidelity US Coach Tours". Retrieved 2012-12-01. ↑ "Akron Canton Airport". Retrieved 2012-12-01. ↑ "Amtrak - Stations - Alliance, OH (ALC)". Amtrak. Retrieved 2012-12-01. ↑ "The Independent Contact Us". Massillon Independent. Retrieved 2012-12-01. ↑ "WTIG-AM Radio Station Information". Radio-Locator.com. Retrieved 2012-12-01. ↑ "David Canary Home Page". Retrieved 2012-10-30. ↑ "The Story of Mayhew Folger". Massillon Museum. Retrieved April 15, 2011. ↑ "Bob Knight". Library Factfiles. The Indianapolis Star. Retrieved 2007-05-29. ↑ Portrait and Biographical RECORD OF Sheboygan County, Wis. Chicago: Excelsior Publishing Co. 1894. pp. 201–202. ↑ "Machinist's Mate First Class Robert R. Scott, USN, (1915–1941)". US Department of the Navy. December 3, 2000. Retrieved February 17, 2009. ↑ "Former Tuslaw Great Ryan Travis signed by the NFL's Seattle Seahawks". The Massillon Independent. July 27, 2011. Retrieved August 10, 2011. ↑ Lawrence, J.M. (June 9, 2008). "James Young, 78, physician to Kennedy and Johnson". The Boston Globe. Retrieved December 3, 2009. 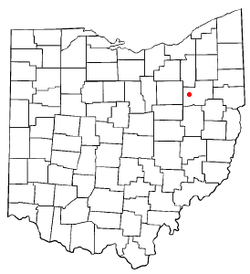 Wikimedia Commons has media related to Massillon, Ohio.